poor stephen jackson can’t figure out why nobody likes him and why everybody thinks he’s a bad guy…. NEW YORK –(recently traded) Golden State Warriors star Stephen Jackson claims people have been portraying him as “the bad guy” since he went public with his trade request in August. Jackson signed a three-year, $28 million contract extension last November, but his relationship with the franchise has became strained. Jackson was suspended two games during the preseason for an outburst directed at coach Don Nelson, and played just 18 minutes Wednesday night. 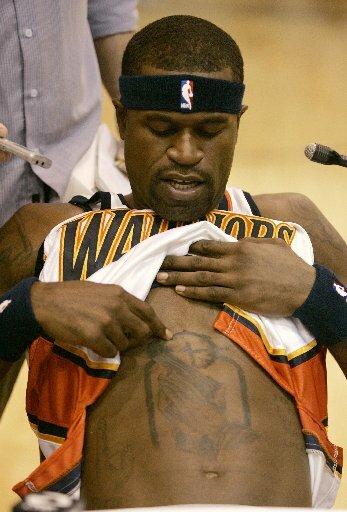 but stephen jackson seems to have forgotten this…..
would it help or hurt if stephen jackson went shirtless more often?